After a week, the s.g. for the Mt. Baldy Bitter was 1.007 at 60° (corrected from 1.006 at 70°), down from 1.035. This works out to 3.7% abv, right about at my estimated target of 3.6% (and well within expected measurement error, I presume). I added 3/4 cup of priming sugar boiled in 2 cups of water, and then bottled. It worked out to 41 12-oz. bottles and 4 22-oz. bottles. 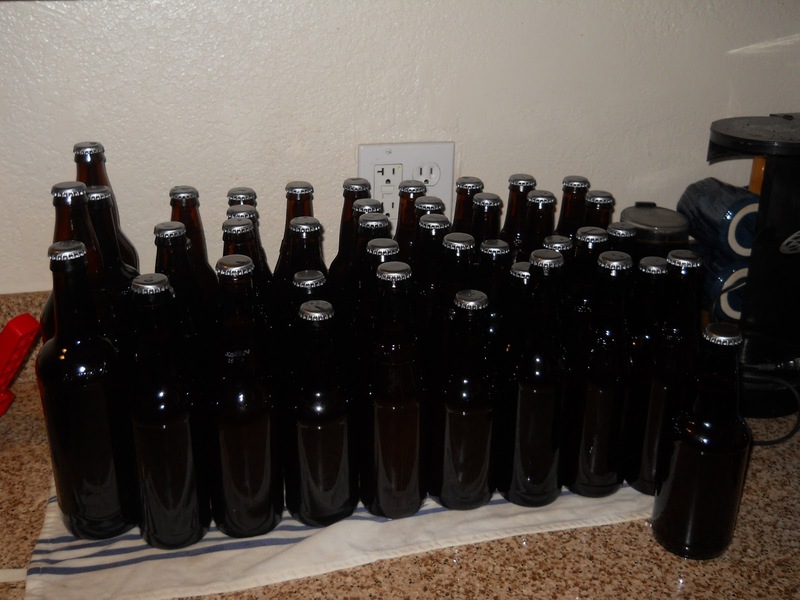 Now they’re carbonating and bottle conditioning; I expect to try the first next weekend. The overall flavor in the uncarbonated beer is light and slightly bitter, but so far I don’t get the sense of a lot of “body” in this one. That well may change after some conditioning; if it doesn’t, I’ll probably add some carapils or a similar grain in the next iteration. This entry was posted in English bitter and tagged Mt. Baldy Bitter. Bookmark the permalink.